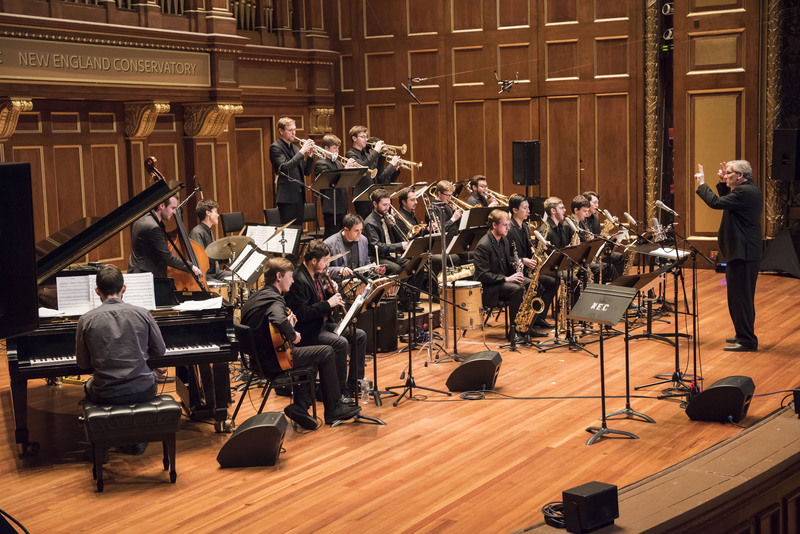 The on-going celebration of New England Conservatory’s 150th anniversary brought well deserved attention to the Jazz Studies and Contemporary Improvisation departments for the 2017-2018 performance season. 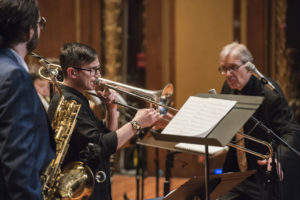 On March 1st, at Jordan Hall, NEC presented a very special tribute celebration to the legacy of Bob Brookmeyer, the legendary jazz musician (valve trombonist, pianist) composer, arranger, conductor, teacher, performer and mentor to many jazz musicians, particularly at NEC. The evening provided a rare opportunity to listen to 4 original orchestral works by former NEC students, including a 150th Anniversary commission by Doris Duke Artist Darcy James Argue(02’ M.M.) Argue was a Doris Duke Artist Award recipient in 2015. 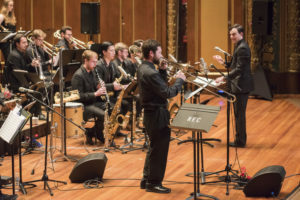 Ken Schaphorst, conductor of the NEC Jazz Orchestra, directed a concert performance of Brookmeyer’s music, coupled with extraordinary contributions of original orchestral works by four NEC alumni. A fitting tribute to Brookmeyer’s dedication and contribution to NEC as a teacher for ten years between 1997 and 2007, founding and directing the Jazz Composers Workshop Orchestra, thereby adding a vital component allowing “an on-going ensemble devoted to rehearsing and performing works by NEC Jazz Composition students.” Thanks to the musical drive, gift of mentoring, foresight and leadership, J.C.W.O. (founded and directed by Brookmeyer) provides an orchestra(now led by Frank Carlberg) that gives young composers “the opportunity to learn how to rehearse and conduct a band, as well as have their works heard.” In 2008, Brookmeyer was awarded an honorary doctorate from NEC in recognition of his distinguished musical career and his invaluable contributions to NEC. He was also named a National Endowments for the Arts Jazz Master in 2006. 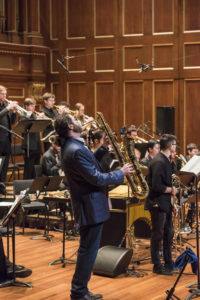 This extraordinary evening offered performances of four new orchestral jazz compositions by NEC alumni Nick Urie, Ayn Inserto, Mehmet Ali Sanlikol, and the 150th Anniversary commission by Doris Duke Artist, Darcy James Argue. Under the sure-handed conducting guidance of Ken Schaphorst, Brookmeyer’s close friend and long-time colleague, the transition from piece to piece was seamless and mesmerizing. Schaphorst also started the evening with his own composition, “Take Back the Country”, an incredibly rich, tempo changing selection that also resonated Brookmeyer’s political tones, as a statement of current division in our country. 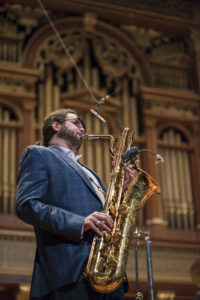 Each of the four original compositions were conducted by NEC alumni, some of whom were directly mentored and supported in their professional development by Bob Brookmeyer. Speaking to the audience that night, each composer gave sincere credit to Brookmeyer for having been a direct inspiration and motivator for them, pushing their boundaries and keeping their passion on track. The fruition of accomplishment was clearly heard by the audience, in NEC’s Jordan Hall this evening. Here, clearly, was an example of how one passionate teacher can harness the skill and talent of students and guide them through an evolution to these superb individual compositional statements. An enthusiastic audience was quick to respond to the technical level and innovative arrangements by these young conductors. Also hats-off to an outstanding and spirited NEC Jazz Orchestra, who apparently had very little lead time to learn these compositions. There were also several stand-out soloists, on saxophone, trumpet, and trombone, who took turns in melodious and dexterous interpretations of each piece. As each young conductor took stage to deliver their orchestral jazz composition, there was an individual story behind the music. Nicholas Urie, who left L.A. to study composition with Brookmeyer in Boston, now performing and recording internationally, premiered his piece “Finality”, which combined vocal singing with an influence of Kerouac “beatnik”- style poetry against a sometimes gritty and un-conventional key of orchestral sound. He also effectively featured a member of the orchestra for a blistering, bebop-style saxophone solo, which heightened the piece. Ayn Inserto, in her composition “Down the Rabbit Hole” drew inspiration from Alice in Wonderland (one her husband’s favorite books) and the remembrance of the period of time they were dating, and when she fell in love. Inserto states her influence, “The Brookmeyer techniques I used for this piece were a combination of the pitch module and white note exercise.” Inserto’s lively conducting complimented spirited horn solos and some frenetic fast paced tempos that added to the beat that drives this piece. Mehemet Ali Sanlikol, a Turkish composer, had a very personal traumatic take on his orchestral piece “Temmuz”. The nature and moody sound of the piece is a direct reflection upon the helplessness and fear he experienced in the U.S. during the brutal coup d‘ état attempt in Turkey on July 15, 2016, while his family (wife and daughter) were still in Turkey and he could not contact them to understand their fate. A forbearing dramatic piece “with seven-beat Turkish rhythmic cycles”, including use of traditional Turkish musical instruments, ney (end-blown flute), zurna (double reed pipe), nekkare (small kettle drums) and further complimented by Sanlikol’s exquisite and haunting vocal sound in the style of Turkish Hafiz (Koranic chanters). Beautiful and mysterious. Finally, internationally acclaimed composer, Grammy-nominee and recipient of the 150th NEC Anniversary commission, conductor Darcy James Argue took the stage, to debut his orchestral work “Winged Beasts.” Argue described taking exotic inspiration from symbols of ancient civilization, in the form of the colossal Assyrian “human-headed bull, lion-legged” figures placed at the entrance to the palace of King Sargon II(700 B.C.). With quick wit and humor, Argue described these creatures as an analogy to organizing the pieces of an orchestral work. In a quote from Newsweek’s Seth Cotter Walls, which could easily apply here, referring to Argue’s Secret Society 18-piece ensemble, “for a wholly original take on big band’s past, present and future, look to Darcy James Argue.” Argue delivered with complexity, and immensely entertaining value, both “in your face and then in your head.” All the moving parts came together. As an enormous treat and finale for the event, NEC Conductor Ken Schaphorst took to the stage to introduce a special performance on lead instrument by Brian Landrus, internationally renowned jazz multi-instrumentalist(specializing in baritone and bass saxophones, bass clarinet, and alto and bass flutes), band leader and composer, to feature solo baritone saxophone playing on Brookmeyer’s “Celebration Suite” and also featuring Eric Stilwell on trombone. The sampling taken of tracks “Jig”, “Slow Dance”, “Remembering” and “Two And” are from Brookmeyer’s 1999 release New Works Celebration, which received rave reviews from DownBeat, JazzTimes, AllMusic and other notable critics. Stunning in its diversity, with a resonance and richness of full orchestral sound, each track has its own mood and pace. Brian Landrus showed his chops with stand-out virtuoso command of the baritone saxophone, reaching beautiful lower register tones. An exquisite overall orchestral performance. A perfect ending to a special celebration and remembrance, with exceptional musicianship including the introduction of the next formidable generation of orchestral jazz composers. Bob Brookmeyer certainly would have been proud.